THE GRID made its debut in 2012 and has become a staple playing card deck from 4PM DESIGNS. Inspired by a digital world of vibrant light and circuitry, GRID 3.0 follows its predecessors by keeping elements that made THE GRID and GRID 2.0 so popular. Plug back into the grid with the next chapter in the GRID playing card saga! 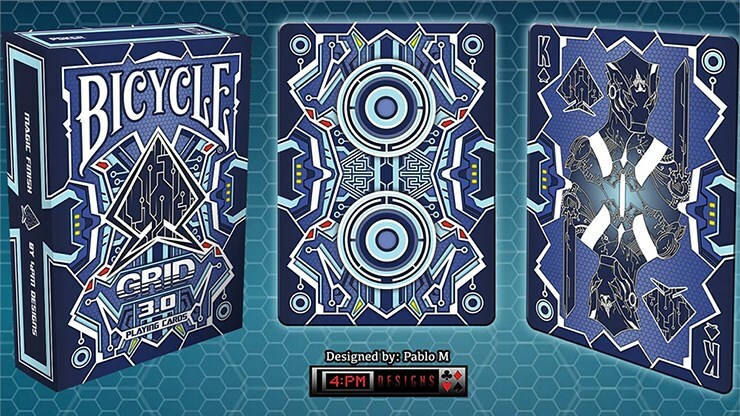 Consisting of 56 cards, this deck is manufactured by the USPCC® with their world famous Bicycle® Brand and stock. Trusted by cardists and poker players around the world. For the first time in The Grid Series, there has been a complete make over of the courts and have all new original artwork. Each court class will have a similar design with original elements suitable for each of the courts. Similar to the courts, the numbers cards have also gone through a redesign and all include the circuitry which has been a consistent element in the grid.